The Millennium M25 and M50 HANG-ON treestands each offer a lightweight, comfortable and quality treestand all in one. Made with the agile hunter in mind, these treestands allow for quick setup and are easily moved, but still provide the rock-solid Millennium quality you've come to depend on. 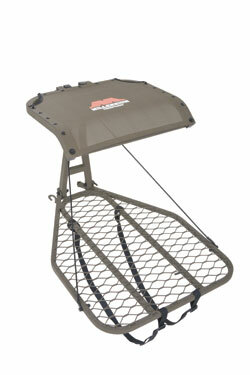 The Silent Hunt Design keeps the stands quiet, yet comfortable and functional during the hunt. The ComfortMax Seat, featured in both stands, allows you to sit comfortably for hours while you wait on that big buck to appear. The M25 HANG-ON treestand is made of steel and weighs a scant 17 pounds, making it super easy to pack along and setup wherever the hunt may take you, be it unknown terrain or tight cover. It provides for roominess and comfort with a 24-inch by 30-inch platform and 20-inch by 17-inch seat that sits 17 inches from the platform. The treestand is rated for 300 pounds, which makes it a solid choice for you and all your gear. The M50 HANG-ON treestand has all of the technical aspects of the M25 plus the Interlock Leveling System, which allows you to level the seat and platform independently. It also accepts the Millennium camLOCK Ratchet Strap Receiver, which allows you to preset multiple stand locations for quicker stand changes. For those hunts when packing light is required, or when needing to change stand locations quickly and easily, be sure to take the M25 or M50 treestand along with you. For more information on Millennium M25 and M50 HANG-ON treestands, check out https://millenniumstands.com.